This workbook is an edition specially prepared to completely encompass the syllabus in Drawing 2 of the First Year – Bachelor of Technology, Engineering and other related courses with various specializations. This course provides the students with rudiments of working drawing. 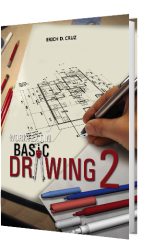 This enables the students to apply fundamental principles learned in introductory drawing. The subject covered two parts: 1) First, it deals with the review of Orthographic and Pictorial Drawings. At this stage, while grasping the fundamentals of multi-view projections and pictorial drawings, more stress should be laid on accuracy, precision and neatness. Speed, which is also an essential requirement, can be achieved with constant practice. 2) Second, it deals mainly with the principles of dimensioning, scaling, sectioning, auxiliary views and pattern & surface development and their applications to simple machine parts for the purpose of their vivid description. This is completely prepared so as to conform to the current practices of length measurement and projection system. Practice exercises have been added purposely for drawing interpretations. The author strongly believed the students will benefit immensely with the proper use of this workbook.